The main barrier reef lies approximately 20 miles east of Placencia, a journey which normally takes 45 minutes to an hour and has some of the most spectacular diving in the entire Belize barrier reef. On the reef are several small beautiful coral islands ranging in size from one half to four acres. Most of these cayes have restroom facilities, barbeque pits and picnic tables which make them perfect spots for a surface interval when you are on a scuba diving day trip with Splash Dive Center, and a visit here enhance your scuba dive package. Dive sites around these islands are roughly 5 to 10 minutes away towards the eastern edge of the Belize barrier reef and make great fun dive trips. The cayes we visit include Silk or Queen Cayes, Pompion Caye, and South Water Caye. Diving and snorkeling around these islands are excellent with a great variety of marine life and our expert guides will introduce you to new aquatic life to marvel at. Silk or Queen Cayes are 20 nautical miles east of Placencia in Southern Belize. The boat ride to these beautiful cayes takes about one hour and then an additional 5-10 minutes to the dive sites. You will be amazed at the beauty of these dive sites. This is one of the premier dive sites in the area and offers just about everything one can hope to see on the Belize Barrier Reef. This site is full of marine life with highlights including huge black groupers, hawksbill turtles, spotted eagle rays, green and spotted moray eels, and schools of horse-eye jack and schoolmasters. Occasionally reef sharks, manta rays, and even the whale shark can be seen cruising in the open blue water. This dive is usually done as a multi-level dive starting at 80 feet/24mt off the wall then working up to about 40 feet/12 mt on top of the reef crest. This dive starts at 30 feet/10mt in sandy bottom which resembles a white hole from the surface. Traditionally a fishing spot for local fishermen, this site has a lot of marine life. Schools of yellowtail and dogtooth snappers, several different species of grouper and many other commercial species are seen here in the 60 feet/18mt range where most of the activity occurs. 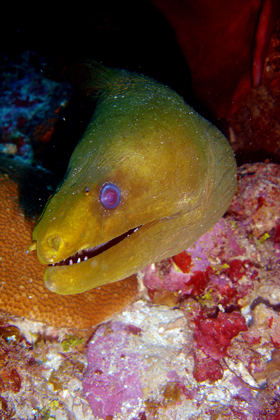 In the sandy areas mixed with patches of corals, stingrays, moray eels, and nurse sharks are usually found hiding out. The terrain here slopes gently to the outer wall of corals to about 70 feet/21mt then drops steep to a few thousand feet. Keep an eye out for spotted eagle rays swimming in the blue. Just north of the north wall, this site has a lot to offer on a second dive. Canyons sloping down to about 60 feet/18 mt offer a perfect resting place for hawksbill and loggerhead turtles. This is a good spot for micro-photographers wanting to capture smaller juvenile species including spotted drums, cleaner shrimps and arrow crabs. Recently a number of lion fish have been spotted in this area probably attracted to the juvenile species. The entire dive is done in and around the canyons in the 50 to 60 feet/15-18 mt depth range. Pompion Caye is about 20 nautical miles east of Placencia. The boat ride takes about one hour and then 5-10 minutes around Pompion Caye you will enjoy the beauty of the following dive sites. Location: 1.5 nautical miles southeast of Pompion Caye. Start this dive in about 30 feet/15 mt of water then work your way down the slope to about 45 feet/14mt where there is a sheer wall which drops down a few thousand feet. Off the wall there is lots to see in the 70 foot/21mt range where many crevices forms a protective habitat. Creatures that can be seen hiding out include the spiny lobsters, green moray eels, spider crabs and hawksbill turtles. Lots of colorful Caribbean reef fishes can be seen on top or along the wall as well. 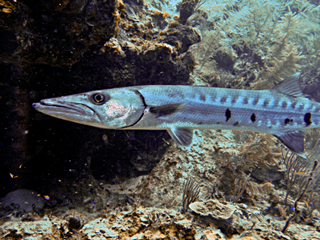 Pelagic species such as the king mackerel, wahoo and a few smaller species of tuna can be seen occasionally off in the blue water. The Pompion canyon is an interesting formation of corals that has plenty to offer. This dive is conducted by swimming in and out of the grooves looking for the usual critters that enjoy hiding out and resting in the grooves. These creatures include nurse sharks, southern and yellow stingrays, lobsters and moray eels. Horse eye jacks, schoolmasters and grunts can be seen in schools around huge spurs in the reef. 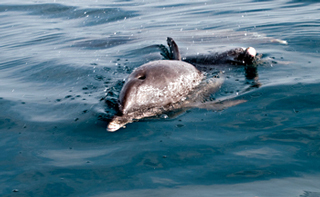 This dive can be done swimming north to south or south to north depending on the current. South Water Caye is 24 nautical miles north-east of Placencia. The boat ride takes about 1 hour and thirty minutes. Because of the time and distance, this destination is usually done as a three tank dive and may include the intriguing Shark Hole dive site. This site got its name from a long time resident of South Water Caye and is just a minute away from the island. It is perfect for a second dive. There is plenty to see diving between the two reef structures at depths ranging from 45-60 feet/14-18mt. Sightings here could include southern stingrays and nurse sharks in the sandy bottom, spotted eagle rays, turtles, schools of tarpons and a wide variety of smaller tropical reef fish thriving around healthy corals. This site has a unique formation of corals that go deep and then shallow. It is important to monitor your depth gauge and follow your dive master. The ridge here has some big barrel sponges with cleaning stations where huge barracudas and groupers visit resident cleaner shrimps. Also to be seen here are colorful tube and vase sponges that attracts many juvenile spotted drums. The wall here starts at 45 feet/12mt and drops to a little over 100 feet/30mt. It then goes east a few feet before it drops into the blue. The dive is usually done in the 60 foot/18mt depth range where little crevices can be seen along the wall. This is a perfect hiding spot for spiny lobsters, huge spider crabs, and spotted eels. Eagle rays and turtles are quite common at this site and our resort divers and photographers rate this site as one of their favourites. This is probably one of the most impressive walls in all of southern Belize. From about 40 feet/12mt a sheer wall drops into the blue abyss. Many overhangs can be seen with beautiful black corals and several species of gorgonians. The visibility at these reefs often exceeds 100 feet/30mt. It is important to monitor your depth gauge as the dips in some areas are deeper than they appear. Critters here can include eagle rays, turtles, lobsters, nurse sharks, and schools of blue wrasse in mid water. The Shark Hole is a sinkhole in about 30ft/10mt of water just inside the main barrier reef north of the Tobacco Range of islands. The hole was found by fishermen exploring and hunting permits and tarpon for sport fishing. These two fishes in large schools can be seen hanging out at the entrance of the hole. This is probably what attracts the several species of sharks that can be seen in and around the hole. Shark species that have been seen includes bull sharks, lemon sharks, reef sharks and nurse sharks. 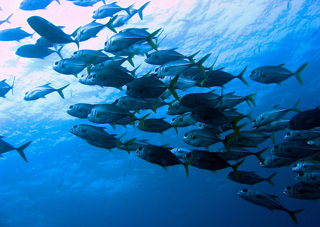 Other species that can be seen here includes schools of horse-eye jacks, snappers and cobia. After entering the hole at 30ft/10mt, a dive light is necessary as the upper portions of the cave becomes dark as well as the need to monitor your depth and air gauge. The dive master will also be better able to keep track of his divers. Spotting around increases your chance of seeing sharks swimming around or resting in the crevices. A ray of light can always be seen shining down on a sand mound through the opening of the cave. This dive is a good opportunity for the cavern diver adventure dive. Because of the distance to this dive site, this dive is usually done as part of a three tank dive and makes for an exhilarating scuba dive day trip.